I’m reminded a lot of this song lately, it’s playing in my song almost daily for the first time since my teenage years. It seems like a whole lot is changing and there are a lot of new beginnings going on. This time though, the boy child has graduated his preschool and is moving onto a Montessori in a whole other place, with new people, and is leaving creche, and his baby days, behind. I think I’m more emotionally crippled by it than he is. He seems to be taking it in his stride. It’s a school for four-boys, he says, like that’s something every single child needs to do and is well able for. Of course, a lot of that came from us originally, he didn’t quite come up with the concept himself, but he’s definitely taking it on board better than I am. This is the place that he’s been since he was a tiny baby, back when I was unsure about leaving him with complete strangers. The place he caught every disease going and grew his immune system in the process. He made friends, made memories and learned so much. The women who cared for him through those days left an imprint on us, and it’s a change for everyone to move on from that. We made the decision to not send him to school this year back in February. I was very torn about it at the time. He was still three when the letter came in the door to say that we had a place for the school we really wanted for him this September. While I knew he would be four and a half by the time the day to go to school came, in my head he was TINY and my baby and definitely not ready for school. But, on the other hand, the school was a very sought out one and I was terrified that even though he would be put on a list for next year’s enrollment, that he would lose out by not going this year. I spoke to the women who taught him daily in creche and discussed it with other parents at length. Personally, I started school later than everyone else in my class because they waited until I turned 4 on September 17th to allow me to start. Oh, 1995 and your teacher-constrained classrooms meaning schools encouraged sending kids earlier to “save the teacher”. I had already spent a year in playschool and my mother has told me that I thrived in the structure of it all, the sitting at a desk and doing things. I was ready for the school side of school. In hindsight though (which is the only way we can ever look at these things), I wasn’t socially ready for school. I was, unsurprisingly, the youngest in my class by four months, and many of the kids in my class were a full year older than me. I was a socially awkward child who didn’t mix well. My head was never out of a book. I didn’t make friends easily and was bullied throughout my school career. It’s not to say that none of this would have happened had my parents waited until I was five. It probably would have. However, I probably would have been that bit more socially developed to be able to keep up with my peers and hold my own a bit more. Also, even with transition year, I finished school at 17. This meant I didn’t have the same social life as many of my classmates in the last few months. And then there’s that whole making decisions as to what I would do with my life at seventeen. It just feels so young. If Eliott were to start primary school this year (2018), he would be just after turning 18 leaving school even if he did do Transition Year. While 2032 feels a whole long time away, I’m told it absolutely flies in the blink of an eye and I’m in no real rush to get there. The preschool teacher who I spoke to most about it made the point that nobody has ever regretted holding a child back a year, but they can regret sending them too early. However, the point was also made that in staying exactly where he was, there was a very strong chance he would be bored and therefore it would be best to bring him somewhere else. Trying to find a full time childcare place was much harder than I had anticipated – the full time being the key. There were places offering 9am to 12pm left, right and centre but NOBODY wanted to keep him past 12pm. Which when I had to think about the whole work thing was never going to work. We started regretting NOT sending him to school. We viewed a place that made my soul hurt a little by how restricted they had the kids – the word cages is by no means an exaggeration on some of the places they had kids. And then we got lucky. We found a really nice place less than a ten minute drive from our house, and super close to where we hope he will be going to school in September 2019. Even better, they had spaces and liked the sound of our little man – bonus! And so, we left the old creche behind. We organised leaving dates to match up with our holiday dates. 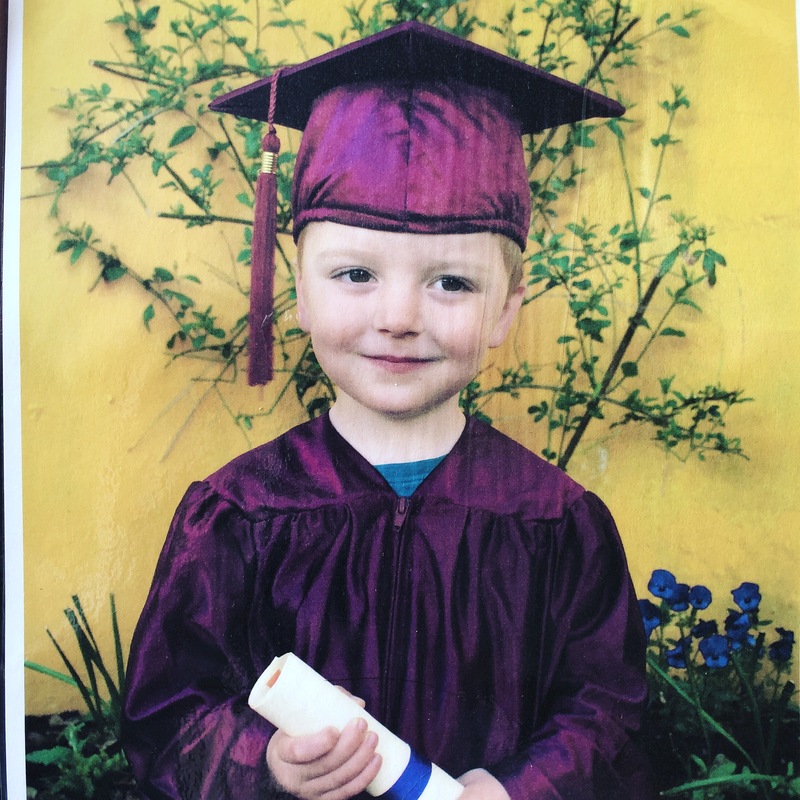 Unfortunately, we missed his graduation due to clashing dates with something we had already booked way in advance (the Mammy guilt is satiated by the fact that he’ll have another one of those). We still got a cute picture of him all gowned up though – even though it’s all a bit of pretend, it is VERY cute. The legendary preschool teachers spent HOURS putting together scrapbooks of pictures, drawings and quotes from the year which is truly one of the loveliest things I’ve ever been given – a yearbook of our son’s life in their care as such. And then, the final day came and we said goodbye, and leaving creche was complete. I think I was more gutted than the child about leaving creche. He’s excited for this big boy school, big boys who DEFINITELY weren’t babies. He’s bought into it, we think. There are some teething issues, some attitude, some tantrums but I think those are par for the course with all the changes going on. He starts properly this week after some starter sessions. It seems to be going really well. It’s a new start, and we’re all adjusting to it – I can only hope that it’s as good an experience as the previous one was and that this year goes really smoothly. If you’ve got any tips and tricks for the adjustment to leaving creche behind (for everyone’s sakes! ), or any notes from your own experience I’d love to hear them – leave a comment below, or chat to me over on Facebook or Twitter. I’m also on Instagram if you want to pop over and see what we’re up to!